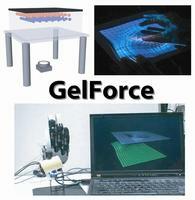 GelForce is a novel type of interface that measures the distribution of both the magnitude and direction of force. The sensor is composed of a transparent elastic body, two layers of blue and red markers and a CCD camera. Force vectors are calculated from the captured movement of the markers. From the simple structure of this elastic sensor, we are now developing the finger shaped sensor for a robotic hand.